I had to work late again tonight so I’m once again looking for something quick to make and that supplements the leftover chili I had for supper again. I finally decided to make Miss Fenwick‘s version of Dropped Scones. She’s from Toronto so I’m curious how she’s connected to the 1898 New Galt Cook Book. I’m going to cut this recipe in half so that it is a more manageable quantity for me. I sifted 1 1/2 cups of flour and 1/2 teaspoon of baking soda together into a bowl. I added 1/2 tablespoon of butter and finally 1 cup of buttermilk. I skipped the salt since my butter is salted. I used the typical buttermilk from the store although it is not the kind Miss Fenwick would have known. I mixed everything together and then removed a small piece and shaped it into a scone. I “baked” it in a frying pan on top of the stove. Once the scones were cooked on one side I flipped them and cooked the other side. It was time to taste. Miss Fenwick of Toronto might be Alice Oliver Fenwick. She was born in 1873 in Toronto to William and Euphemia. She married Frank Gibson in 1899. There is another Alice Fenwick but she seems to have died in 1891 and there is also a young domestic named Mary Fenwick. However, Alice Oliver Fenwick’s mother Euphemia was a Bell. At her death she was buried in Galt so I think she must be connected to the community somehow. There was a large family of Bells in Galt so I suspect she was related somehow. I haven’t found the link yet. It is interesting that this recipe calls this a dropped scone since they are actually shaped by hand rather than dropped onto the pan from a spoon. I made a couple of the scones too thick but the rest were good. I like that they don’t have to be rolled out or baked in the oven. They might be better baked in the oven but they work on top of the stove. Take three cups of flour, with one good rounded teaspoonful of soda sifted through twice with the flour; add a tablespoonful of butter, two cups of buttermilk, a little salt; make a rather stiff batter; take off a small piece at a time and shape with the hand on the bake-board. Bake like other scones. Today has been a full day with work, dinner out and then a Barra MacNeils concert which I’d forgotten about and had to race to get ready to attend. Therefore I need a quick recipe from the 1898 New Galt Cook Book. I decided on a recipe from Mrs. McIlwraith for Oat Cake. I selected it in honour of this wonderful music with its roots in Scotland just like this recipe. Oat cakes are a classic of Scotland. I used my bag of Bob Red Mill Scottish Oatmeal which might be a bit coarse for this recipe but is better than rolled oats for this sort of recipe. I put 1 cup of oat meal in a bowl and added 1 tablespoon of melted butter. I’d hoped to make this recipe with beef drippings but I didn’t have any yet. Then I added about 1/4 teaspoon of baking soda to about 1/4 cup of boiling water. I mixed it together and had to add a bit more meal since it was too wet to roll out. I heated a frying pan and added a bit of butter. I fried the oatcakes on one side and since I didn’t have a fire to toast them I simply flipped them over and fried the other side after spreading a bit of meal on top. It was time to taste. Mrs. McIlwraith contributed quite a few traditional recipes to this cook book. I made her Soda Scones on Day 252 so I’m going to copy and paste tonight since it is getting late and I have to work tomorrow too. Mrs. McIlwraith was Mary Goldie daughter of John and Margaret. Mary was born in Scotland in 1834 and came to Canada with her family. In 1862 when Mary was 27 she married 31-year-old Andrew McIlwraith who was also from Scotland. Thanks to Ian Wilson we can see Mr and Mrs McIlwraith! He gave me permission to use Goldie family pictures in my blog. I suspect this picture is from their wedding based on the clothing. She is wearing the full bell-shaped skirt of the era and a spoon bonnet. The Street Style exhibit currently at the Waterloo Region Museum has a dress like this on display. The couple appear to have had eight children although some only survived a few months. The family lived in Listowel in Perth County as well as in Galt. I’ve just discovered that Andrew kept a diary and that this family’s life is described in some detail in a book called More of a Man: Diaries of a Scottish Craftsman in Mid-Nineteeth-Century North America. It’s by Andrew Holman and Robert K. Kristofferson. It describes Andrew’s death in 1891 in some detail but Mary lived on until 1911. Her death at 76 was attributed to old age. I put a somewhat crumbly and hot oatcake on a plate along with a generous spoonful of quince marmalade made yesterday. The oat cake was crispy on the edges but the flavour is bland like the other oat cakes. I think I need a finer grind of oatmeal as the type I used makes it a bit crunchy. The oatcakes were great with the marmalade. They were certainly made for each other. Wet a cupful of fine oatmeal in a small tablespoonful of roast beef dripping (dripping is better than butter for it makes them crisp) and a very little soda with boiling until quite stiff. Roll out quickly til very thin then dust with meal, sweep the meal off again and put on a very hot griddle. Bake on one side only, then rub over with meal again and sweep it off and toast before the fire the side which was not on the griddle. Keep in a dry place and when going to use put in the oven for a few minutes to make them crisp, then set ion the edge to let the steam escape. They are much better done on the griddle than in the oven. To keep with the Scots food theme I’m going to try another of the oat cake recipes in The New Galt Cook Book (1898). This time it is Oatmeal Cake from Mrs. W. B. Wood of St. George. I’m not going to make a full recipe since there’s a good chance I won’t like these things. I’m cutting it in half. First I mixed 1 cup of flour and 1 cup of oatmeal. What sort of oatmeal? I used a package of Scots oatmeal. Next I added 1/2 cup of sugar and 1 teaspoon of baking powder. Finally I mixed in 1/2 cup of lard and then 1/4 cup of hot water. Once everything was blended I took some of the dough and rolled it out. I wasn’t sure how thin to roll them but I made it about 1/4 inch thick. I cut them in small squares. How big is a small square? I made them about 2 inches square. I baked them on a cookie sheet at 375 F. for 10 minutes. They were starting to look a bit crispy around the edges so I removed them from the oven. I tasted one while it was warm. Mrs. W. B. Wood of St. George Ontario is a prolific recipe contributor to this cook book so I’ve talked about her several times. Ellen Elizabeth Malcolmson was born to James and Margaret when they lived in Niagara or at least that’s what I thought. Tonight I found Ellen and her husband in the 1881 census and it says she was born in Quebec — well the transcriber thought it but when I looked at the scan of the census page it is clear that it is an O not a Q so she was born in Ontario after all. Ellen married William Blake Wood in 1872. He was a miller and they had four children. Eventually they moved to Montreal where William headed up Dominion Mills. That’s where Ellen died when she was 83. This version of oat cakes is like the others — an acquired taste. I used a coarse ground oatmeal and so the Oatmeal Cake has a bit of a nutty texture but it is still dry and bland like the typical oatcake. I happen to like them but maybe that’s memories of eating them in interesting places. You really have to like the flavour of oatmeal to enjoy eating an oatcake. Consider making this recipe if you like oatmeal porridge and oatmeal cookies otherwise it is unlikely you’ll acquire a taste for oatcakes. Two cupfuls flour, two cupfuls of oatmeal, one cupful of sugar, one cupful of lard, half cupful of hot water, two teaspoonfuls of baking powder. Roll them, cut in small squares and bake. The scent of wood smoke is lingering around me and I don’t mind at all. Today I felt right at home cooking over the open-hearth in the wash-house at Joseph Schneider Haus Museum in Kitchener. I was there as part of their Heart & Hand Festival. They bring in all sorts of different artisans and my specialty was food history. I made potato soup using a recipe from Day 3 that was a big hit with everyone who tried a sample today. I also prepared Highland Scones using a recipe Mrs. Wanless of Toronto contributed for the 1898 New Galt Cook Book. I took my scale with me so I could weigh the flour and butter needed for this recipe. I put 1 pound of white flour in a bowl and then mixed in 3 ounces of butter. I added a bit of milk along with the 2 eggs. I kept adding milk until I had a dough. Once I rolled out a bit of the dough, I used a tin cup to cut out some scones and then placed them on a heated frying pan. When the scones were browned on one side I flipped them over to cook on the other. It was time for me and others to taste some Highland Scones. Considering that Toronto is already a large city in the 1890s, I’m always surprised that there is just one Mrs. Wanless in the city in the 1891 census. She is Susan Kinsmen daughter of Daniel and Joanna and was born in England in 1831. She came to Canada when she was about 14 and married a man named William Bell just two years later. She was just 16 years old and William was 22. They had two girls Elizabeth and Jenny. I haven’t been able to find out exactly when or why their father William died but he was in his early 30s. It must have been before 1860 because Susan married John Wanless Sr that year. They lived in St. Andrews ward and later St. Patrick’s ward and eventually the couple had four more children including a son also named John. He followed in the family jewellery business and even has a Toronto school named after him. Check it out here. Susan died of pneumonia in 1901 when she was 71. Her husband John lived for many more years. He seems to have been quite resilient since according to the newspaper excerpts cited on this website, he endured being attacked during a robbery at the jewellery store. Scones in this cookbook are nothing like the scones people expect at high teas. Those are fluffy and more like tea biscuits but the scones in the Galt Cook Book are paired with recipes for oat cakes and pancakes. Very few of them are baked in the oven. Instead they are baked on griddles or frying pans just like I did today. I used a cast iron frying pan for some of the scones and then tried out my new griddle. Some people commented that the scones reminded them of bannock. They are not anything special but they are not horrible either and went well with the soup. One pound flour, three ounces butter, hot milk sufficient to make a dough, two eggs. Mix the flour and butter together, then make into a dough with the milk and eggs. handle quickly, roll out and cut in any shape or size required. Bake on a griddle or thick-bottomed frying-pan. Serve hot. I was at work today and then went out tonight so I’m making something quick — Dropped Scones. The recipe was contributed by Isa Gardiner for The New Galt Cook Book (1898). I often get an impression of the contributor after making her recipes even before I’ve started to research the person. I assume that Isa Gardiner is an older single woman because of her use of the words basin, and tartaric acid. I also think she’s a very precise person. Her recipe is very detailed for so few ingredients. I also think she lives in a small household since this recipe makes a very small amount. I didn’t even have to reduce the recipe to make a manageable amount. I did as Miss Gardiner instructed and mixed the dry ingredients first — 1 cup flour, 2 teaspoons sugar, 3/4 teaspoon baking soda, and 1/4 teaspoon tartaric acid. I wondered if she really meant cream of tartar but since I had tartaric acid on hand I decided to use it. I’m curious about the end result. Once these dry things were mixed I started slowly adding the 1 cup of buttermilk. I used modern cultured buttermilk — the kind you can buy in any grocery store — but this is far different from the buttermilk of 1898. It would be the byproduct of making butter from non pasteurized (or homogenized) cream. I beat the mixture a bit as the frying pan heated. I don’t have a griddle so I used a frying pan. I put a bit of grease in and once it was hot I started dropping spoonfuls of the mixture into the pan. The batter was more like a biscuit dough. I kept the blobs small since I was worried about how easily they would cook. The idea of waiting for bubbles makes me think of pancakes so I wonder if the mixture was supposed to be more liquid. I never saw any bubbles but once they were brown on the bottom I turned them to cook on the other size. I only turned them once and when both sides were cooked I removed them from the pan and got ready to sample. Isa Gardiner is probably Isabella Gardiner. I was getting nowhere searching for Isa until I checked Waterloo Region Generations. There I discovered Isabella Gardiner. Finally I had a starting point. She was born in Scotland around 1858 to Isabella Waters and James Gardiner. I’m not sure when she came to Canada but her parents and brother and sister are here too. It looks like she arrived in her mid twenties around 1885. She and her sister Elizabeth are living at #8 Rich Avenue in Galt with their father in the 1911 census. Their father died in 1912 and so in the 1921 census the two sisters are living in the home with two young teachers Lilian Beamish and Edith Pickles who are lodging there. Isabella dies in 1933. I made these scones small and so they were cooked through rather than gooey inside which had been my worry. After my first bite I decided to split them to spread a bit of butter and jam inside. They are very bland without some sort of spread, at least to my taste. This recipe doesn’t include any butter or salt among the ingredients. I think this is a recipe in which you can safely substitute cream of tartar for tartric acid and in fact might find it improved. I’d worried that the tartaric acid would make them too acidic but they were just find. Although I call these bland they flavour of the buttermilk and the touch of sugar make them interesting. As a modern cook I’d add a pinch of salt just to give that lift to the flavour. Perhaps that’s why Miss Gardiner suggests greasing the pan with bacon rind? I’m keeping this recipe on hand. It has to be the easiest way to make a “bread” in a hurry and would be ideal on a hot day since it is a stove top recipe. That wasn’t the case in 1898 when the entire stove would get hot even when just the top was required. One cupful flour, one cupful buttermilk, two teaspoonfuls soft sugar, three-quarters teaspoonful soda, one-quarter teaspoonful tartaric acid. Mix in a basin the flour, sugar, soda, tartaric acid, add gradually the buttermilk, beating it well for a few minutes. Have ready a hot griddle, which rub over with a piece of suet or rind of bacon. Put the mixture out in spoonfuls, taking care they are neat round shapes. When the scones are covered with bubbles on the top, turn them over. When they are a light brown color on both sides they are ready; should not be turned twice. It seems ironic that I’ve been avoiding the recipes in the Scone section of The New Galt Cook Book (1898) since they are one of the foods often associated with Scotland and England. However, they usually call for a piece of equipment I don’t own — a griddle. Tonight I’m going to go ahead and try Mrs. McIlwraith’s recipe for Soda Scones. I put 2 cups of white flour in a bowl and then added a pinch of salt, 1 teaspoon of baking soda and 1 1/2 teaspoons of cream of tartar since my milk is regular not soured. I mixed that all well and then I rubbed in 1 tablespoon of butter. I started adding 1/4 cup milk and then another 1/4 cup. As I mixed I realized that 1/2 milk was probably too much. Either do it by the dribble and don’t worry about an exact measure or try 1/3 of a cup milk instead. My dough was a bit sticky but I went ahead. It was at this point that I started to wonder about my next step. I’m assuming I’m to roll out the dough but to what thickness. How big a piece? Am I making individual round scones or a large round that gets cut into sections? Based on some of the other scone recipes in the cook book I made it 1/2 inch thick and I chose to make an individual scone. I put the round of dough on the hot frying pan, yes I baked the scones on a frying pan to simulate the effect of a griddle. Ideally I would have at least used a cast iron frying pan but I don’t have one of those either. I preheated the pan at high heat and then lay the scones on. I had to keep reminding myself that I wasn’t making pancakes. I kept trying to flatten them as they rose a bit. Once they were browned on the bottom I turned them and “baked” them on the other side. I removed them and tried to stand them on edge. I was eager to sample since they looked good so I broke one open and spread it with butter. Mrs. McIlwraith was Mary Goldie daughter of John and Margaret. Mary was born in Scotland in 1834 and came to Canada with her family. 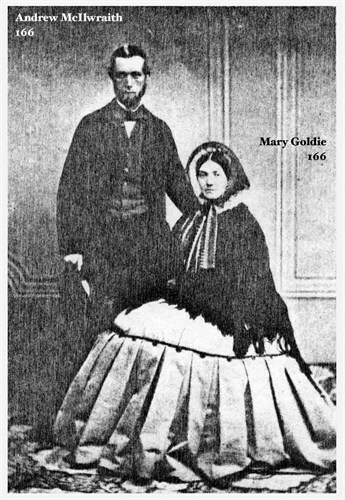 In 1862 when Mary was 27 she married 31-year-old Andrew McIlwraith who was also from Scotland. Thanks to Ian Wilson we can see Mr and Mrs McIlwraith! He gave me permission to use Goldie family pictures in my blog. I suspect this picture is from their wedding based on the clothing. She is wearing the full bell-shaped skirt of the era and a spoon bonnet. The Street Style exhibit currently at the Waterloo Region Museum has a dress like this on display. The couple appear to have had eight children although some only survived a few months. The family lived in Listowel in Perth County as well as in Galt. I’ve just discovered that Andrew kept a diary and that this family’s life is described in some detail in a book called More of a Man: Diaries of a Scottish Craftsman in Mid-Nineteeth-Century North America. It’s by Andrew Holman and Robert K. Kristofferson. It describes Andrew’s death in 1891 in some detail but Mary lived on until 1911. Her death at 76 was attributed to old age. Soda scones are well named because I could taste a hint of soda although that could be the power of suggestion. These scones are okay but not wonderful. I was afraid they would be doughy but they were cooked through. My pancake vs scone mistake could account for their density but I still think these are not a light scone. This could be a good starter recipe since it uses cups rather than pounds of flour. It also makes a reasonable amount. Rubbing in butter is classic technique and yes your hands get messy but that is part of cooking and baking historically. One of my hesitations in making scones is that so many people seem to have widely varying recipes, methods, and expectations as to the taste and appearance of a “real” scone. Based on the number and variety of recipes in the cook book it was the same situation in 1898. Into two cups of flour and a pinch of salt rub a piece of butter the size of a walnut, one teaspoonful soda, and one and one-half cream of tartar if the milk is sweet, and if sour use very little cream of tartar. After all is well mixed put in enough milk to make a stiff dough, stiff enough not to require any more flour but just what will keep it from sticking to the board. Bake on a moderately hot griddle. When done set on edge in a dish and roll in a damp cloth. I have some buttermilk I need to use so I’m going to make Miss Maud Terry‘s recipe title Oat Cakes (Good) which appears in the Scone section of the 1898 New Galt Cook Book. As usual to save my budget and waistline I’m going to make half this recipe. I measured 2 cups of Red Mill’s Scottish oatmeal into a bowl and added 1 cup of flour. I’m not sure this oatmeal is as fine as intended but it is a much smaller meal than regular oatmeal. I stirred it together with 1/4 cup of white granulated sugar, 1 teaspoon of baking soda and a dash of salt. Now it was time to add the last few ingredients. I tried to blend 1/3 cup of butter with the dry ingredients but I needed the moisture of the 3/4 cup buttermilk. My buttermilk is modern cultured buttermilk rather than the byproduct of butter production which Maud Terry would have known. Once this was all mixed I took some and rolled it out to 1/2 inch thick. I wasn’t sure if I was to cut out the oat cakes or just back it on a cookie sheet. I decided to cut them in squares much the same as the previous version of oat cakes I made back in January. I baked them on a cookie sheet at 350 F. for 15 minutes. Miss Maud Terry is far harder to find than I expected. I have her full name and assume she is living in Galt and yet she’s not in the 1891 or 1901 census . . . at least under that name. Waterloo Region Generations website lists an Emily M. Terry but she lives in Hawkesville in Wesley township. I simply can’t find anyone who seems a likely contributor. Oat cakes are one of the foods that seem synonymous with Scotland. 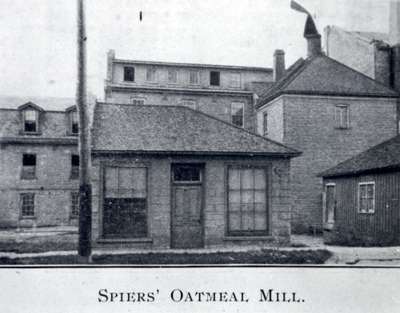 There was even an oatmeal mill in Galt in 1898. The dough for Miss Terry’s Oat Cakes is good and the baked version is good too. They weren’t as dry as I expected and they were sweeter too than some oat cakes. I’d recommend this recipe if you want to try this traditional “bread” of Scotland. Four cups fine oatmeal, two cups flour, one-half cup white sugar, three-quarters cup butter, one and a half cups buttermilk, one teaspoonful soda, a little salt. Mix soft and roll out about one-half inch thick. Bake in a moderate oven.